The Knox County School Board tonight approved a resolution urging the state to overturn the A-F school grading system set to go into effect this year. Knox County joins a growing resistance to the model being proposed by the Tennessee Department of Education. NOW THEREFORE BE IT RESOLVED BY THE KNOX COUNTY BOARD OF EDUCATION AS FOLLOWS: The Knox County Board of Education hereby urges the Tennessee General Assembly to repeal legislation reducing schools to a single letter grade designation and, instead, in the best interest of students and schools, allow schools to publish multiple measures alongside any summative designation, as outlined in the Every Student Succeeds Act Final Regulations, which were not available at the time this legislation was passed. (ESSA, Final Regulations, pg. 101). BE IT FURTHER RESOLVED, that this new system should reduce the use of high-stakes, standardized tests, encompass multiple assessments, reflect greater validity, and, more accurately reflect what students know and can do in terms of the rigorous standards. The Knoxville News-Sentinel reports that the Knox County School Board will consider a resolution in opposition to the state’s proposed A-F school report card. The A-F grading system has come under fire from educators and district leaders across the state. “Branding a school with a single grade, on the other hand, could be both misleading and demoralizing,” Thomas wrote. “I can only imagine how it’s going to play in the African-American community when we place an F on several of their beloved, neighborhood schools. A vote on the resolution, sponsored by Board Vice Chair Amber Rountree, is expected to come this week. Lincoln County has joined those giving low marks to the state’s A-F Report Card for schools. Collierville’s School Board recently joined the chorus of those expressing concerns over the state’s new A-F Report Card for schools. Interestingly, the legislative sponsor of the idea is also now calling for a delay in the plan. Collierville’s school district voted Tuesday evening to lobby against a new state accountability system that assigns schools a letter grade from A through F, and leaders of some other Memphis-area school systems are likewise raising concerns. The article notes that district leaders in Millington and Germantown are also concerned about the new system. Based on the initial feedback, it looks like the plan is headed for a grade of “F” from educators. Ripley High School Principal Joey Hassell has been tweeting this weekend about the state’s move to an A-F grading system for schools. The new system came about because of a legislative mandate. Hassell’s not happy about it. Interestingly, Hassell was formerly an Assistant Commissioner at the Tennessee Department of Education. As you can see, Hassell is quite unhappy with the move to the new grading system. His opinion seems to be supported by at least some district-level leaders based on likes and retweets he’s received. The A-F system is set to start next school year, based on results from this year’s battery of tests and other data. The legislature could make changes to the proposal in the upcoming legislative session, which starts on Tuesday, January 10th. Or, she will be. The Commissioner of Education is going on a statewide tour to talk about testing in light of new flexibility offered to the states under the federal ESSA law, which replaced No Child Left Behind. Commissioner Candice McQueen and senior department leaders are launching a statewide listening tour to gather input from educators, key advocates, parents, students, and the public to determine how to implement specific components of the nation’s new federal education law: the Every Student Succeeds Act (ESSA). The feedback will inform a Tennessee-specific ESSA plan that will guide the department’s work over the coming years and help the state capitalize on the new law’s empowerment of local leadership. These conversations will also build off feedback the commissioner has received on her Classroom Chronicles tour, during which she has met with more than 10,000 Tennessee teachers to learn how policies impact the classroom. Over the summer and fall, department leadership will draft a plan for transitioning to ESSA based on stakeholder and public feedback. Stakeholders and the general public will have another opportunity to provide input on the draft plan later this fall. 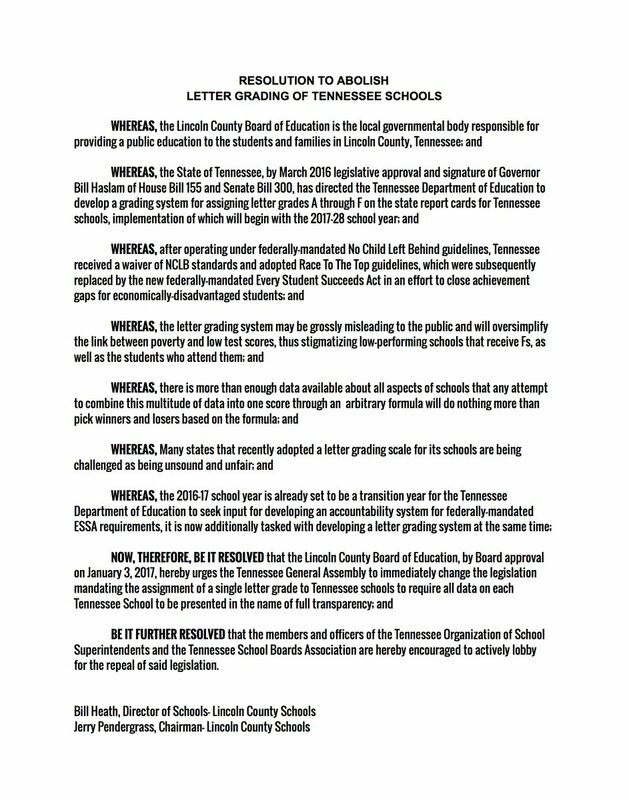 In spring 2017, the department will work with stakeholder groups, the State Board of Education, and the Tennessee General Assembly as needed to recommend changes to state law and policy, as well as develop further guidance for school districts. In addition to the various feedback loops and meetings across the state, the department will also be guided by its strategic plan, Tennessee Succeeds, which was developed with input from thousands of stakeholders over the course of several months to establish a clear vision for the future of Tennessee’s schools. It also has established a solid foundation in preparing to transition to ESSA. Perhaps one improvement that will be suggested is that in addition to developing portfolio models for teacher evaluation (they already exist for related-arts teachers), the state should also provide funding to districts to support their implementation. Few districts use the state’s approved portfolio model for non-tested related arts teachers, likely because the cost of doing so is not covered by the state. Assessment includes both additional staff time and compensation for those performing the portfolio assessments. The second item of note is: Develop additional valid and reliable student growth measures for those areas that do not currently have them. This statement assumes that current methods of evaluating student growth (TVAAS) are valid and reliable. To put it simply, they’re not. Additionally, the most common method of assessing student growth is through standardized testing. This raises the possibility that additional tests will be provided for subjects not currently tested. After this year’s TNReady failure, it seems to me we should be exploring other options. Nevertheless, I’m hopeful that this summer’s listening tour will lead to a new dialogue about Tennessee’s direction in education in light of ESSA. States like Hawaii are already taking student test scores out of the teacher evaluation process and moving toward new measures of evaluation. Out of the chaos of TNReady, there is opportunity. Educators, parents, and students should attend these summer meetings and share their views on a new path forward for our state’s schools.